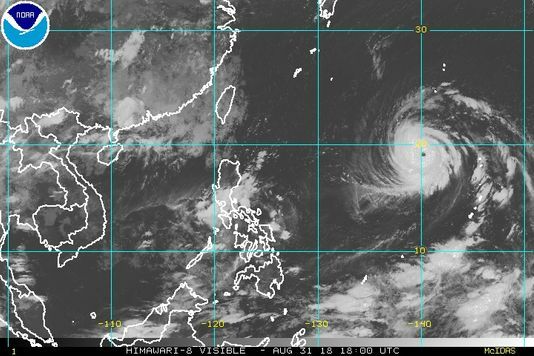 Casey Mcshea, Staff Writer| On Tuesday, September 4, Super-Typhoon Jebi slammed Japan’s mainland as an intense Category 1 storm, with wind gusts reaching 130 miles per hour and flooding reaching 20 inches in some areas. The storm was the worst disaster the country has seen in decades, the last being Typhoon Yancy in 1993, which killed 48 people. Tuesday’s storm has left at least 11 people dead, more than 160 injured, and nearly 200,000 others have been left without power. More than 1 million people were advised to evacuate their homes, and hundreds of flights out of Kansai International Airport were canceled before the storm hit. The airport closed after high tides flooded its two runways, cargo storage, and other facilities. The storm’s powerful winds also sent a 2,591-ton tanker slamming into the side of a bridge connecting the airport to the mainland; the bridge was damaged enough to make it unusable, leaving about 3,000 passengers stranded at the airport. 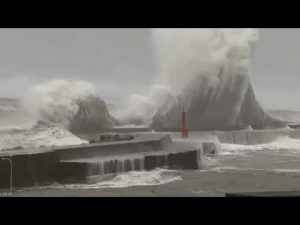 Social media users took to Twitter to post footage of the storm. One user’s video showed an 18-wheeler and a car being thrown onto their sides and parts of both vehicles ripped off and thrown into the water. The individual taking the video can be heard shouting in distress. In the days before the typhoon hit the mainland, Jebi classified at a Category 5 super typhoon, the strongest storm on the planet in 2018. The storm weakened as it approached the island, but its combined speed, high winds, and Japan’s terrain increased its impact. United States-based storm chaser, Josh Morgerman, reported on Twitter “the wind made a constant, high-pitched howl, bordering on a scream. Felt like more than a Category 1.” The tweet was accompanied by a video of trees blowing violently and tilting because of the winds. The video also showed rain and water wildly blown by the powerful winds. The Mainichi, a daily Japanese newspaper, reported that the storm surge reached at least 3.29 meters (almost 11 feet) above normal tide level. According to their information, those heights surpassed a prior record of about three meters from Typhoon Nancy in 1961. Only two days after Jebi hit the mainland, the northern Japanese island of Hokkaido was struck with a 6.7-magnitude earthquake in the early morning. The quake has caused at least 41 deaths, according to Japan’s Fire and Disaster Management Agency, and triggered a series of landslides across the nation. Two people are still missing, at least 641 are injured, and evacuation centers are still holding about 2,600 people. Japanese Prime Minister, Shinzo Abe, said more than 22,000 troops from the country’s Self Defense Forces have been involved in rescue efforts for the earthquake and landslides. Forty thousand people have assisted in total. The landslides were amplified because of the amount of rain the country had received from the typhoon. About 3 million households lost power, but almost half of those had power the following day. As of September 7, Kansai International Airport has partially reopened. Domestic flights were expected to resume the same day and international flights later that day.